Built on a former WWII site for coastal defense, the Nike Missile launch site near Point Vicente is one of the most preserved coastal Nike sites in Los Angeles. It was originally situated above the Marineland of the Pacific, which was closed in 1987, shortly after being purchased by the Sea World of San Diego. Nearby, the WWII turrets can still be seen near the batteries where large guns and artillery were housed. Located between Hawthorne and Palos Verdes Drive, on the aptly named Nike Trail, the administration buildings and barracks have been converted into what is now Rancho Palos Verdes City Hall. LA-55 converted to the RPVA City Hall, 1975. While some buildings have been converted for use by city programs, the launch site is now the maintenance yard for the city. Signs and equipment are stored near the missile magazines, in various Nike buildings, and the check point guard station. The area surrounding the site has developed quite a bit since closing in 1974, however, many aspects of the site itself are easily found. Near the missile magazines, there are still the doors, vents, electrical boxes, and even some of the original fencing, which the city uses to surround the maintenance yard. Along the fences you can see multiple flood lights that were originally installed to light the launch area. A couple of buildings still have numbers. The "Generator" building still has its nameplate, and is attached to an interesting electrical station. On one of the original pathways that leads from the city hall to the launch area, is a plaque has been dedicated to explain the site's Nike history and its use by the city. 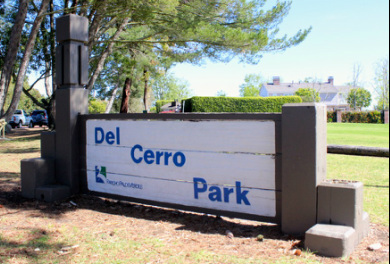 Part of the site has been converted into a dog park for residents. Tennis Courts, which were installed by the army, also remain. The maintenance yard had also stored some of the remaining pieces of Marineland. However, the most unique aspect of this particular site, is actually the most hidden. Covered by the overgrowth of bushes is the only remaining dog kennel of any of the Nike missile sites in Los Angeles. 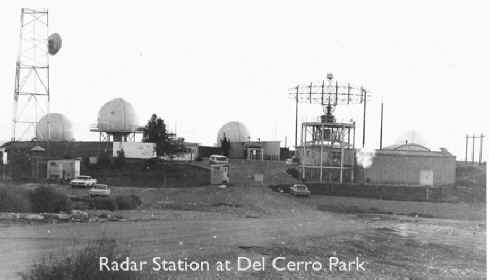 On the hill above the launch area, in Rolling Hills, sat the IFC site, which has been destroyed and replaced by Del Cerro Park. Aside from some remaining pieces of broken up pathways, the radar site has completely vanished. It is interesting that while reuse has preserved the missile site, it has also led to the destruction of the nearby radar site. The park is visited daily by residents, hikers, and their pets. From the edge of the park, is a beautiful view of Catalina Island and the city, which includes the missile launch site. *Special thanks to the Fort MacArthur Museum's Francisco Lacy for providing a tour of the site.